Ten lower sixth students are to donate all the profits from their LEAP business to Pakistan flood victims. The youngsters, who established Cloud Nine – Business Relief to combat workplace stress, were moved by the plight of the Pakistani people after a member of their company was caught up in the disaster. Sanna Tahir, the group’s finance director, was visiting family in Pakistan when the floods hit this summer and wanted to do something to help. So far they have raised £1000 from the sale of a range of stress busting products, including a self-help book Stress Proof Your Business and Your Life, and aromatherapy goods like reed diffusers, scented candles and aroma dough. They have sold products at school and also had a successful stand at Harewood House autumn fair. They also recently went to a business exhibition and conference in the East Midlands where they attended seminars and sold their books. The book has been written by Steve Pipe and Elizabeth Wilson. Steve, a business author and inspirational speaker, is the father of Cloud Nine’s managing director Katie Pipe and is also acting as the group’s mentor. Managing director Katie Pipe said: “We have had some really positive feedback about our business from customers who have been impressed that we are pledging all our profits to help others. 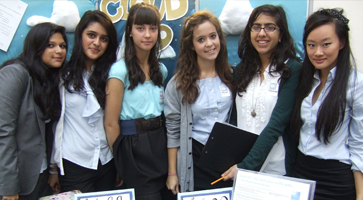 Cloud Nine are Urvashi Chahal, Rachel Levine, Yasmine Motashar, Naomi Orme, Katie Pipe, Holly Smith, Jessica Sutherland, Sanna Tahir, Katie Woodcock and Helen Ye. Members of the Cloud Nine team with some of their products. They are (L-R) Urvashi Chahal, Sanna Tahir, Naomi Orme, Katie Pipe, Yasmine Motashar and Helen Ye.